President of Ukraine Petro Poroshenko has given the 'Star of the Hero' decoration to the widow of slainjournalist Georgy Gongadze. "Almost in 16 years after tragic death of Giya [Georgiy Gongadze] I have an honor and a huge responsibility to pass you and your family the golden star of the Hero of Ukraine – the highest state decoration, which by right belongs to Georgiy Gongadze," Poroshenko said during handling the award ceremonies on Monday, as reported by the president's press service. 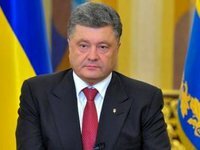 Poroshenko noted the huge contribution of Gongadze had made in the development of independent Ukraine, the fight for freedom of speech and development of independent media. "Georgy sacrificed his life for Ukraine. He is an example of what kind of a real Ukrainian should be," said the head of state. For her part, Myroslava said: "Giya has been always ready to give his life for the sake of Ukraine. And if he had been alive, of course he would have been there – on the eastern front. If he had been alive, he would have been proud of this award!." It was reported that journalist Gongadze went missing in Kyiv on September 16, 2000. In November of the same year a headless corpse was found in the woods in Kyiv region. Experts concluded that it might belong to the journalist. In 2009, the remains of a skull were found in Kyiv region, which, according to the Prosecutor General's Office, belonged to Gongadze. However, the body has not been buried yet. The journalist's mother Lesya Gongadze had refused to acknowledge that the found remains belonged to her son. She died on November 30, 2013. On January 29, 2013, Kyiv's Pechersky district court ruled that the former head of the Ukrainian Interior Ministry's outdoor surveillance department Olexiy Pukach be sentenced to life imprisonment for the murder of Gongadze.